So I was trying to make a particle simulation where the particles collide with a fixed gear that rotates when the particles collide with it. 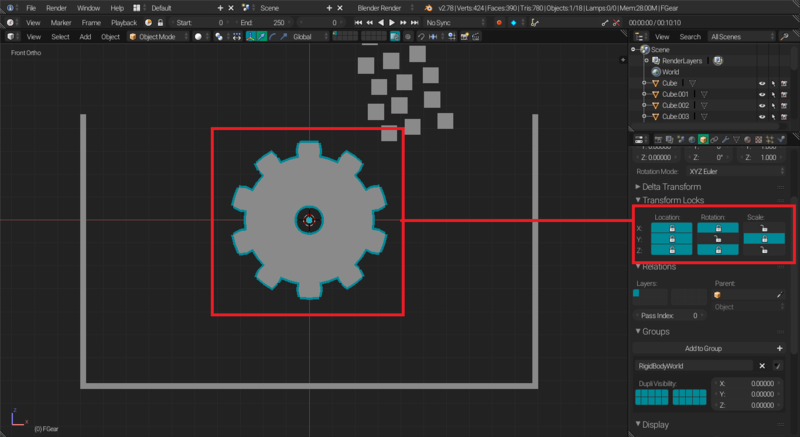 As you can see I have locked the locations of the gear and limited the rotation to the Y axis only in the transform locks in the object settings, I also added rigid body active and collide physics to it (collide because I need the particle system to collide with it). I added a plane and added a particle system to with the particles set to object (Cube), as you can see the particles surely collides with the gear but the gear doesnt rotate like it did previously when the same thing was done with cubes. So how do I make the particles collide and rotate/move a rigid body object ? I was just looking into this over the weekend. I believe a recent tutorial on Vit Prochazka's youtube channel has the answer you seek. I'd love to try and explain it here, bit it is quite convoluted and it requires the Animation Nodes add-on. Not the answer you're looking for? Browse other questions tagged particles transforms rigid-body-simulation or ask your own question. Is there a way to make particles behave like rigid body objects? How do I make particles collide with object surfaces? Irregularly-shaped rigid bodies and molecular particles?